Today is one of my favorite moments in the Catholic church. My family does a Christian Seder. We have a Benjamin Family Haggadah. I make the lamb and the Seder plate. My husband buys the wine for us adults and the grape juice for the kids. He makes sure that we all wear our sandals to dinner. I'm an actor at heart. I get to tell the stories of Moses, Elijah, and Jesus' Last Supper. Passover is about sharing your faith with your family. One of the treasures in my heart is that a tradition that I started alone while I was a single girl in College, is now shared with my husband and my children. I remember the toast that my husband said "Next year in Jerusalem!" the pre-Easter of 2002. He said that toast with such joy and hope a few weeks before he finished graduate school. Today we were coming home from buying the lamb for Passover. My 10 year old son Alex said in the, "Now guys, we have to put the lamb's blood on the door so that I get to save my life!" We'd played April Fool's Day Tricks on each other all day. I shrugged my shoulders and said "Oh, Alex, we don't need to bother with that part anymore." "This year, John is here. We now have an extra boy in case you go." There was a second of pause. Then I said "April Fool's Day! Alex, you are irreplaceable to us!" My son let me tickle his hair. Then five of us let out this beautiful laugh in the car. "This year, John is here!" For the first time in 10 years Alex won't be the only son at the Passover table. The gift of Baby John is amazing. We finally had a son who lived. It's the yearly tradition of Passover that lets us all take those mental snapshots and rejoice in the changes of our family. Last night we read about the Last Supper from Matthew. "And he reclined at table." I took a second out to explain that in Ancient Roman times people sat on couches when they ate dinner. My almost First Communion Recipient said "Mom, the picture is wrong!" She meant the Leonardo da Vinici painting of the Last Supper. I told her that she was right! That painting was made by an artist almost 1500 years after the Last Supper and his best guess about the table wasn't very accurate. We also talked about how silly it was to have all 13 guests sit on only one side of the table. Maria and I decided to look it up today and draw our own version of the Last Supper. In my 7 year old's eyes, this image for the Last Supper is wrong. This image for the Last Supper is right. I love the comparison of the two. The second table seems really intimate. It feels like getting to hang out with Jesus at a Slumber Party. It's also so shocking that Judas lied to Jesus right inside his personal space. "Surely, not I Rabbi?" My family had a lot of fun joking around about other possible ways Jesus could have answered Judas. "You've hung out with me for 3 years. You've seen me heal the blind and get dead people talk! What else do I need to do to convince you that I am the Son of God!" Today we will celebrate the Last Supper with a Christian Seder at home. I hope to go pray at Adoration tonight. We have lonely Good Friday, and quiet Easter Saturday, and then the joy of Easter Vigil. Why I'm Grateful My Baby Has Colic! I have a baby with colic. Actually, my little man has "infant acid reflux." I call it colic when I talk to other people because "my little baby has heartburn" really does not do justice to the amount of stress this condition puts on me as a Mom. My baby is on anti-reflux medication. I'm so grateful that I was a strong advocate for him. After only a month of medication, his weight jumped up from the almost dangerous 15% on the average infant growth chart to 85%. His medication is working. My son has flipped from turning so red and mad that he was burning off most of his caloric intact each day to now merely being a crabby baby who refuses to nap and violently vomits over all of his clothing. This is my sixth time having a child with a variant of this condition. My son is one of our worse cases of infant acid reflux, but I've certainly been here before as a Mom. (We think it's genetic.) Because I've been here before I know that no medicine, no sleep position, no special infant sling, etc is going to help me reduce my son's pain level to zero. I work with my doctor to help monitor my son's reflux. However, I'm done searching for a magic cure. My son will always spend a part of the day crying loud, awful cries. As his Mom, it will always hurt my heart to hear him in pain. This is our life together until he reaches 8 or 9 months and that little immature swallowing apparatus finally starts working better. The thing about colic is that it exposes every single weakness that I have as a human being. ("I thought I was a nice person until I had a kid with colic" could be a Tee Shirt Slogan for me.) For the other two kids who had this condition in an extreme way, the colic period has scared me to death. "What can I do to stop it? When is it going to be over?" As a more experience Mom, I know that this stage will pass. So instead of getting obsessed with "Make this stop now!" or "Why doesn't my baby always have to be the hard one?" I'm developing a resigned patience. If I want delightful, funny, sensitive, and artistic kids with my tall husband--then I get babies with sensitive digestive tracts. I can't have the joy of one without the pain of the other. The thing about having a baby with colic is that situation strips me naked. There is no hiding from myself. Every flaw in my marriage, in my housekeeping, in my homeschooling, in my parenting, in my prayer life--every sinful habit that I have gets magnified when I'm walking around without sleep and either twitching because I hear my baby crying in his crib upstairs or terrified that my slightest movement will wake him up in my arms. For 12 years and 5 babies, I kept focusing on healing the baby. "If the baby stops crying, then I'll feel less stress and become a nicer person." Now, I think "the only solution I've got is to become more holy myself." I'm a little freaked out finishing Lent this exposed. I know what sinful stuff I need to work on. My husband knows what sinful stuff I need to work on. My older kids know what sinful stuff I need to work on. My Catholic prayer friends know what sinful stuff I need to work on. What I'm grateful for is the virtue of humility. When I'm this low, I have no choice but to work on the really broken parts of myself. Right now, I'm healing the parts of myself that were broken before age 6. It's awesome because whenever I patch up something this deep, I can see the results really fast in so many areas of my life all at once. Getting this low is embarrassing, but it's effective. I joked with one of my friends this week. "Isn't Motherhood wonderful? There is a Miraval Resort in Tuscon, Arizona, where people pay thousands of dollars to get the same life lessons that we learn practically overnight, for free!" I mean that comparison to Miraval Resort in a very concrete way. To survive four more months of colic, I have to learn how to cook better. I have to improve my diet. I have to exercise more. I have to ask my husband for a neck massage at the end of the day after holding our son for 12 hours. I have to rebuild my self-esteem, re-evaluate my Faith, and learn how to better manage stress in the moment. All my efforts at self-improvement were optional before. Now my self-improvement feels CRITICAL. That is why I'm grateful for my son's colic. That is why I'm grateful for a hard Lent. It's so easy to drift into complacency as an adult. "Oh, I'm a good enough person for God!" As much as I hate Rock Climbing the Spiritual Mountain for God, it's good for me. Jesus, thank you for dying for my sins. Help me to better slug off my sloth and work harder for the Kingdom of God! "The Catholic take is notice Peter!" and "Remember the Book is Always Better!" Can't wait to watch this on TV with my family on Easter Sunday! It's the last few days of Lent! What a spiritual workout! I'm full of gusto this Monday after a thrilling Palm Sunday Mass. I hope to work hard with all my until Easter Vigil. "He shall purify the sons of Levi!" sings the choir with Handel's Messiah Chorus. Purification comes from prayer, fasting and almsgiving. That is my special work during Lent. Yesterday was my daughter's 12th Birthday. It was also the Feast of the Annunciation. I had a kind of "double vision" throughout the day. I went through the normal events of the day. At certain moments, I could see things with "God vision". It felt stunning and overwhelming. My daughter was conceived at a time when I was preparing for my first trial as an attorney. Trials are the high point of training to be a litigator. Trials are also exceedingly rare. Almost all cases settle well before trial. I had waited 2 years after law school to get a chance to be "first chair" at a trial. Most of my friends outside of public interest law had to wait 5 years to handle their first trial. What I remember most about preparing for trial is looking at the clock in my office. At soon as the clock hit 7 PM, I would make myself leave my desk. It felt like a physical struggle. There were piles and piles of evidence on my desk that I felt all needed to be neatly organized and labeled for my trial notebook. No matter what felt like it was still "undone", I obeyed the clock. "I need to have dinner with Jon tonight!" I told myself. "We're trying to have a baby!" For two weeks, I worked really hard at prepping for my first trial. But I always came home for dinner. I ate my husband's excellent stir fry and then we had fun making out as newlyweds. I looked at my daughter in the kitchen the other day and the memory of watching the clock in my old attorney's office came back to me. I heard a quiet thought in my heart say "Good thing you put first things first!" I felt stunned. It would have been so easy for me to have missed the conception of this child. I was in the middle of my first trial. I had worked through 3 years of law school and 2 years of firm life for that moment. Nothing in my family of origin had prepared me to put my vocation as a wife ahead of my career dreams. I couldn't even explain in words why I was drawn to having my first child at age 27. The whole thing was a mystery. The only thing I can point to is that six weeks beforehand I became a member of the Roman Catholic Church. Good thing you put first things first! I could have missed out on my daughter. What is a spunky, funny, beautiful, unique human soul compared to a few days of showing off my lawyer skills inside a courthouse? There is no comparison. I don't know what other things I'm missing out on in my current daily life by trading the less than perfect "God's will" things for the more important "God's will things". I'm sure its a lot. Good thing you put first things first. God, I want to do more of that! Please help me better follow you this Easter Season! "The Angel Gabriel was sent to the virgin Mary, who was engaged to be married to Joseph." Gotta love those Gospel writers! What brevity! But what happened exactly? 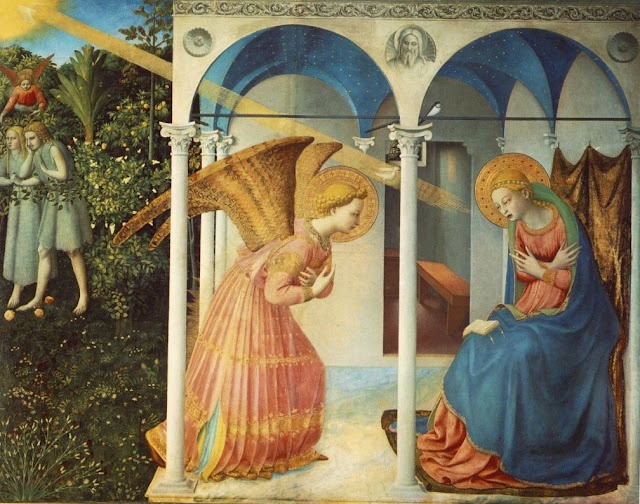 What was Mary doing right before the Angel appeared to her? What did he look like? How did she feel? How could the most important event in human history happen inside an ordinary, rather shabby, house and to a girl most likely under age 15? The Annunciation of Our Lord! A quiet moment with endless depth. Mary, the Mother of God, pray for us! St. Gabriel, pray for us! Question for Lent: Have I Been A Good Friend to Myself? My third child had her First Confession this Lent. Our two parish priest did such a beautiful job leading a community penance service that appeals to both second graders and their parents. For his homily, the priest lead us in a meditation on this painting by the artist Rembrandt. For the Examination of Conscience, the Priest had us look deeply into 3 basic questions. Am I being a good friend to God? Am I being a good friend to others? Am I being a good friend to myself? I was shocked at how badly I failed at being a good friend to myself. Lack of exercise. Perfectionism (a failure to be patient with myself). Lack of time to develop my talents and nourish friendships outside my family. After that experience, I started paying more attention to self-care and my own nourishment. This morning I did a good job on quiet prayer. I ate a real breakfast. I gave myself extra time to do my hair, put on lipstick and change my earrings. After the good example of the nuns of St. Emma's, I focused on doing one small, achievable domestic task at a time. When my 3 year old and 4 year old started fighting at the breakfast table, I easily had mental space to help coach them through their disagreement. The three of us didn't just solve a one time problem. We affirmed a system of how to approach a breakdown in the social contract. I turned back to doing the dishes in utter shock. It's so easy to be a good parent after I take time for myself. I go to CODA meetings every week. I hear a legacy of painful family memories passed down for generations. I wonder now if the pain of codependency is as simple as a generational legacy of a lack of self-care. It is good to care for God. It is good to care for others. I also have a responsibility to take care of myself--especially in the cause of chronic illness (infant reflux) and chronic "there is always a needy toddler in my life". I love Lent! I love coming home to Christ again and again. I love always finding an easier way to do his work with greater joy. St. Joseph, the worker, prayer for us! (For my daughter's First Confession, my parish priest just held up a copy of this painting and helped us experience it deeply for a few minutes. I can't imagine a more beautiful way to encourage more people to experience the joy of reconciliation with God. I love priests that are so connected to Beauty. It was such a St. Bernardino of Sienna moment. (We love him dearly because he is the patron saint of graphic designers, my husband's profession). One of the things I learned while hanging out with the Benedictine Sisters is to appreciate how hard they work. Every single task they do is with God---Singing in Church, Setting the Table, Greeting a Guest. Since I've been home, I've up my work output significantly. Even when I'm tired, even when I'm crappy. I get out of the cozy bedroom that I've been hanging out for five months with my newborn and I do the yucky grunt work that has been mostly gathering dust since I went on bed rest in September. To my shock, I've found that once I get over the painful start of "Oh my goodness, its been another night of no sleep", I do feel better after I get some small tasks accomplished. Work is restful. More restful, than sitting still and watching TV, drinking coffee, reading the internet, or complaining about how little sleep I get with a newborn in my house. It doesn't make any sense to me that small amounts of proper, focused work for God can make me feel better than totally relaxing after a hard night with my baby. I've starting calling this God paradox "refueling in midair." Work is prayer. Prayer is rest. The Benedictine Sisters taught me to "work at prayer, and pray during work." In Tennis, it's always better to play tennis with someone significantly better than you. I think that principle applies also to the spiritual life. Whenever I hang out with someone significantly higher than me on the spiritual plane, I am so excited. I feel like I come back to my regular life with six new power serves. Thank you Benedictine's for being a place of focus and encouragement in the world! Easter Sunday is coming! There is a fantastic way to continue our Lenten Journey of Faith using mainstream TV. 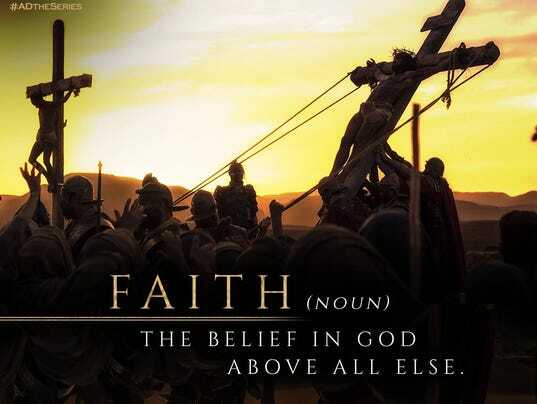 NBC will air "AD: The Bible Continues" at 9 PM on Sunday, April 5, 2015. This 12 part TV series is enthusiastically supported by the US Catholic Bishops. There is a book by Mike Aquilina called "AD Ministers and Martyrs" which outlines the lives and sacrifices of 1st Century Christians. There is also an official Catholic Viewer's Guide to this series. Put this 12 part TV series on your families' calendar! Be prepared to host your family's spiritual development on Sunday night. Get some snacks. Have some books on the table for both children and adults. Get out your Bible. Be inspired! We are a part of God's Easter Message of Hope! There can't be any better way to move forward in 2015, than to spend an hour being reminded of our ancient church's thrilling early history. How Do I Love St. Joseph, Let Me Count The Ways! There is a St. Joseph statue still buried in the frozen ground outside my home for the house sale that didn't happen last December. The statute came from my Mother-in-law, who house sold in an impossible small town market a few months after she unexpectedly became a widow. My Mother-in-law is not a big Catholic. To talk to her about her belief in God and the Saints is a rare delight. Even my Mom trusts St. Joseph to help sell a house. We got her package in the mail and buried her "lucky" St. Joseph statute underneath our For Sale Sign in the front yard. After 10 months of hard work, our dream about changing states fell apart a few days before Christmas. In January, I took the For Sale sign out of our yard. I marked the place where the St. Joseph statute sat with a big rock. My husband and I talked about the fact that so many people we knew sold their house quickly after we asked St. Joseph to look after them. Yet for us, our home sale not only didn't happen as expected, but got delayed 2 to 3 years. This thing that happened to me increased my trust in St. Joseph. Prayers to St. Joseph are not "magic." I don't just pray to St. Joseph for cash, for help with bill, or for a new house. St. Joseph reminds me that "All things work for the good for those that love God." Sometimes St. Joseph helps me gain what I want to with prayer. Often, a St. Joseph prayer changes me. I learn how to be more patient, more humble and a greater lover of poverty. The Scott Hahn book, Joy to the World, changed my theology of St. Joseph last year. I no longer call St. Joseph a "foster father." He did not contribute biologically to Christ. Yet he was in every other sense of the world Christ's true "father." St. Joseph raised Christ, he protected him, he provided him and he loved him. I love the church statues by the alter that have Mary, Our Lady alone and prayerful, and St. Joseph holding a toddler Jesus. St. Joseph often holds Jesus up to his cheek in love and shows him a lily. I am reminded of the Old Testament reading "Oh, how I have loved you. I was like one who held up infants to my cheeks." Jesus Christ, our brother, gave the whole church his mother. He also gave us his Father on Earth, St. Joseph. We can turn to St. Joseph in times of financial uncertainty for help. We can also ask St. Joseph to pray for us when the daily grind gets boring and for a happy death. Oh St. Patrick, How I love you! I had the grace to travel to Ireland a few weeks after my entrance into the Catholic Faith thirteen years ago. It was crazy cool to be thinking about St. Patrick and all the great Irish saints as a new infant in Christ. I'll be eating my corn beef with joy tonight and telling my kids about what I learned about Ireland. St. Patrick, bishop of courage and love, pray for us! I went on a Silent Carmel Retreat last weekend at a Benedictine Monastery. It was glorious! It was so hard for me to leave the baby. (I've got a colicky 4 month old who nurses almost every 20 minutes on rough days). I almost backed out a few times before going on the retreat, but I'm so happy that I went. I had this major breakthrough with the gift of Silence. St. Elizabeth of the Trinity talks about this "humming" that she hears in the middle of Silence in a monastery. The Silence is actually "full" of activity, joy and love. I read that description at a Carmelite retreat four years ago and thought "What she is talking about?" The three times I did a Silent retreat before the Silence felt like "work." I had to work to remember not to talk. Always before the Silence felt a little lonely and barren. I thought that Silence was like a "Fast" from talking. This time the Silence felt amazing. The Silence felt so full of beauty and possibility. I knew what work I was supposed to do in the monastery, and I did it. I felt really close to God. There were questions deep in my subconscious that I didn't even know were bothering me. So many little rough patches in my life got fixed during the retreat. It's hard to describe how close I felt to my fellow Carmelites in my community. Loving them in silence made every interaction so free and easy. For example, there was an elderly man named Bill who read a spiritual book in an empty dining room at 6:30 AM on Saturday morning. I'd been alone in my cell (an individual bedroom) for the past 12 hours. Bill is a quiet guy who I don't know well from a year of shared Carmel meetings. Yet when I saw him reading in the dining room after all that beautiful, exciting time of solitude I thought "There's Bill!" When I went to the dining room, I signed up to set the tables for breakfast. There were 66 people there at the retreat. So as I was doing the soothing, repeated task of laying out 66 place settings, I felt this connection to my Carmelite brother Bill. I thought "There's Bill! He's talking to God! I'm setting the table for God!" All of this connection and wordless support flowed through me without me saying anything. While I was setting the table in the monastery I thought "I wish I could do this in my own house!" When I asked if we could go 30 minutes a week without talking to each other, but loving each other in Silence, my husband's eyes got bright! My poor husband! I'm such a natural chatterbox. I make the mistake of thinking that if I'm constantly talking to him, I'm establishing greater emotional intimacy. Meanwhile, I think he's got the idea that what makes us close is much deeper than our shared conversation. I'm excited that experiencing more Silence at home, can radically help my prayer life. Jesus, he doesn't need my words. Or he likes my words, but Jesus thirsts for something deeper. Jesus wants my heart! I think I'll gradually be more calm and patient with my prayer life (which is intangible) if I spend more time practicing silence with the tangible love of my life, my husband. I'm so grateful for the Sisters at St. Emma's. I only spoke once out loud at the first introduction and heard the Mother Superior speak twice. Yet I feel like I have seven more Aunts in my corner! I can't wait to write to them all about the little individual details of myself and my family. A good nun has space in her heart to love you! It feels so good to be adored, encouraged and strengthened. Pope Francis has made this the year of Consecrated Life. He's asked us to send letters to all the Religious Sisters and Brothers that we know in 2015. My children and I have resolved to touch base with all of our friends in Religious Life and also to make an effort to make new friends this year. I'm so grateful to so many Sisters who have given me encouragement on this spiritual path! St. Benedict and St. Scholastica, pray for us! This Easter give the gift of music to your children and First Communion recipients! The award winning British Boy Choir has a new CD/DVD, a PBS special and a US Tour for their new album, "Angels Sing-Libera in America." Libera is an amazing choir who has sung everywhere. Libera sang at the Papal Mass at Yankee Stadium, the Kennedy Center Honors, and (my husband's favorite sign of a good band) on the Tonight Show. The choir has a five city Easter Tour, including a concert in Washington DC on April 2, 2015 at the Warner Theater. The other concert cities are Boston, San Antonio, Chicago and Atlanta. Buy tickets here! If you can't get to a Libera Easter Concert, (or the thought of combining your young children with classical music makes you cringe) you can still enjoy some beautiful hymns inside your own home. Libera has a newly released DVD and CD called Angels Sing- Libera in America. The Libera DVD was filmed live at 2014 concert inside of the National Basilica of the Immaculate Conception in Washington DC. The lush combination of 40 clear children's voices with a live orchestra against the backdrop of one of the most beautiful churches in North America can't be missed. I was so pleased to see the wide range of hymns included in this concert. So often my beautiful church music CDs are limited only to Christmas music. This DVD includes; "How Can I Keep From Singing? ", "Ave Maria", and "How Great Thou Art." I played the DVD for my 2 year old and 4 year old whose musical tastes are pretty much limited only to tunes from the Frozen soundtrack. My 2 year old said spontaneously "I love this music!" My 4 year old was initially shocked that their were no girls in the choir. (Yes, that's what a boy choir means!) However, she listened to the rest of the concert attentively and quietly. My two girls got through 3 songs peacefully with me, which is pretty much equal to a standing ovation from the preschool set. I often fill up children's Easter baskets with so much junk. This Libera DVD is truly "candy for my ears!" There is something beautiful and instantly uplifting about hearing a hymn. I'm keeping this DVD in the DVD player for the rest of Lent. This choir DVD is such a feast for my eyes and my ears, it is an easy way to get a more prayerful attitude in my life. "She who sings prays twice!" I hope other families are able to experience the beautiful music inside the jewel of a setting that is our Washington DC landmark, the National Basilica. The Libera DVD is going for $14.99 on Amazon. The CD is also $14.99 and MP3 is $9.49. There is also a chance to buy the songs individually for 99 cents each. Many thanks to Allied Faith & Family who helped me review this DVD. If any readers go to a Libera choir concert, please send me an email. I'd love to publish a review about how this great choir sounds in person! Today's Daily Office talks about the Samaritan woman drawing water and her astonishing conversation with the son of God, Jesus. St. Augustine wants us to put ourselves into the story. The Samaritan woman isn't just some random historical figure, she is also a modern day "us." Earlier this week, I made a critique of a new book by Catholic author Bill Donohue. It's not easy to disagree with another Catholic in public, especially someone who is famous and well known. Today's reading gives me courage. In the Mass reading on Sunday, we hear "Jesus did not need to be instructed on human nature. He knew it well." Jesus was not shocked by the Samaritan woman's poor behavior before this meeting at the well. Despite knowing her ugly past and sinful present, Jesus invites her to join him in a conversation. Conversation with God = a conversion. I'm really guilty of taking too relaxed an attitude with my prayer life. I'm convinced that I can't pray over a colicky baby or that other urgent household need should be handled first. The two year old will wake up early and after I attend to her needs, I never get back on track with my prayer routine. Or my husband is home for a rare peaceful weekend morning, and I feel self conscious leaving his company to go pray. St. Augustine reminds me today that my prayer life isn't optional. It's as critical as getting water from the well for my family. Before indoor plumbing, getting water from a well was a daily task. Carrying water was hard work. It was messy. It didn't feel good. Yet it was critical for survival. My prayer life is a conversation with God and one that will have a hidden result, a conversion of my heart. Last week was a tough week for me. We had another blizzard in Washington DC. My baby has colic. By Saturday morning, I felt super irritable and resentful. So I went to confession. My priest was there with so much love and compassion for me, much like Jesus at the well. He reminded me that if I want to change my sin of anger, I need to change the conversation inside my own head. "Anger comes from unmet expectations," he said. "If you want to stop being resentful, flip your thoughts to gratitude." My kid's favorite Lego Movie quote is "Believe! I know that sounds like a cat poster, but it is true!" That movie line seems to fit so perfectly here. It seems so impossible that a quick conversation about sin inside a confessional could turn me around, but its true. It happened. The sacraments are powerful places of grace. St. Augustine's quote reminds me that my conversations with Jesus will bear supernatural fruit. Conversation = conversion. I'm encouraged to keep going deeper in prayer this Lent. May we all travel well on our individual faith journeys and meet in a calmer and more peaceful place this Lent. Book Review: Bill Donohue's "The Catholic Advantage: Why Health, Happiness, and Heaven Await the Faithful"
Bill Donohue's new book, "The Catholic Advantage: Why Health, Happiness, and Heaven Await the Faithful," proves an uneven read. The book's sweeping scope includes political theories, sociological reports, and medical studies to show how religious practices help Catholics live a better, longer, and healthier life. Some parts of Donohue's book are brilliant! Chapter Four, "Coping With Anxiety" is the most concise explanation of redemptive suffering that I've read in six years of studying to become a Third Order Carmelite. Reading this chapter reminded me of spending three weeks with a sick newborn inside Children's National Hospital. My husband and I were physically isolated and yet hundreds of messages of encouragement were posted to this blog. I held our sick daughter while my husband read out loud every new comment as it posted. I experienced the bonds of community, which Donohue mentions in his book, as extending far beyond the ritual "sharing of the peace" during Mass. Donohue has a gift for finding clever quotes that stick a pin into matters of deep theology. For example, he quotes a former Hollywood actress, named Dolores Hart, who once kissed Elvis onscreen and yet quit her career as an actress at its peak in order to became a contemplative nun. "You can't find happiness putting another fancy dress on. Happiness comes when you find someone that you really love, that you can really give your life to." (page 129). Donohue is at his best when he describes the rich interior life of priests and nuns. Yet Donohue's description of the secular worldview disintegrates into an ugly "us" versus "them" mentality. Donohue criticizes Hollywood actors for their poor life decisions with an incredible force. Drug addiction and suicide seem to be at the top of Donohue's "Thank God, I'm not a tax collector!" list. In a weird twist, I found Donohue's chapter on the war crimes committed by Hitler, Pol Pot and Stalin to be written with a less judgmental tone than his paragraphs about the accidental drug overdose deaths of Heath Ledger and Philip Seymour Hoffman. Donohue's central argument misses the messy parts of a more open and gentle worldview. The saint and the sinner coexist to different degrees inside all of us. Religion is more than a set of useful practices or mantras picked up like a self-help book. Faith is a gift! My takeaway from this book is that there is a lot of objective proof that my faith journey is good for me. Thank you Bill! Yet the invitation I have for this author extends to all of us Catholics this Lent. We don't need to sell our Catholic faith, we need to live it! For more book reviews check out the Catholic Advantage Blog Tour from March 3 to March 9th here. On March 5, author Bill Donohue will be a guest on Raymond Arroyo on EWTN at 8 PM EST. "[Jesus] also told this parable to some who trusted in themselves that they were righteous and regarded others with contempt: "Two men went up to the temple to pray, one a Pharisee and the other a tax-collector. 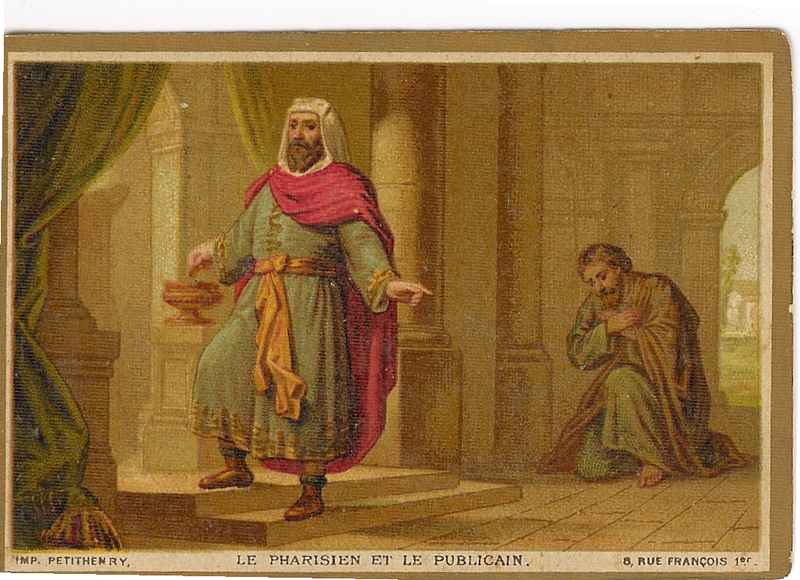 The Pharisee, standing by himself, was praying thus, "God, I thank you that I am not like the other people: thieves, rogues, adulterers, or even like this tax-collector. I fast twice a week; I give a tenth of all my income" But the tax-collector, standing far off would not even look up to heaven, but was beating his breast and saying, "God, be merciful to me, a sinner!" I tell you, this man went down to his home justified rather than the other; for all who exalt themselves will be humbled, but all who humble themselves will be exalted." A Novel Response to "You've Got Your Hands Full!" Today is the feast of Saint Casimir, a Polish prince from the Middle Ages. I was surprised to find that the most famous painting of him in Krakow depicts him with two right hands. Art historians can't decide if its an accident (caused by fading paint) or an intentional decision by the painter. Whoever the cause, the result is pretty cool! The first time I started my novice training in Carmel, my instructor said "No one is ever going to print you a Thank You Note in the Church Bulletin for completing your quiet prayer time, but you still need to do it!" I assumed that idea also applied to canceling church volunteer projects in order to attend to the needs of my individual family. Yet here is the actual email correspondence with my priest last week. Setting: There is a desperate need for volunteers to take the Eucharist to our local hospital. This once a year training meetings has sat on my calendar for 3 months. Fifteen minutes before I am supposed to leave, I finally accept that my four month old son is not going to cooperate that day. I wrote my parish priest the following email. Sorry, I had to cancel my plans to attend your Hospital Ministry today. I have a colicky newborn son who won't settle today. I believe I'll need to postpone my involvement in this service for at least six months because my son is pretty unpredictable and has high needs. In the meantime, I'll have lots of opportunity to pray and offer up sacrifices for this ministry. Thank you for all your work in bringing Hope to the sick. Glory be to Jesus Christ! You have chosen well. Your vocation should come before your apostolate. Prayer is important! As Tennyson wrote: "More things are wrought by prayer than this world dreams of." May God bless you and your family!" Knock me over with a feather! When does someone THANK me for putting my high needs baby ahead of filling a spot in a thin volunteer schedule? But it's right. There is a orderly process for service work (or charity, as we call it in Catholic lingo). If you have some hidden act of service in your life that is keeping you from signing up for volunteer projects that you want to do and getting your name printed in the Thank You Box of the church bulletin, please consider this post as your personal thank you note! Thank you for keeping things in their correct order! Don't get discouraged. When you have a prayerful heart, you are connected to the whole world. Remember that "more things are wrought by prayer than this world dreams of."